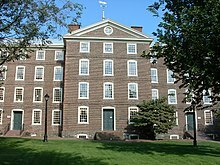 ^ Brown University Admission Facts and Figures. Brown University. [October 8, 2014]. ^ With a 13.4 percent return, Brown University’s endowment grows to $3.5 billion. ^ Facts about Brown University. Brown University. November 2013 [September 29, 2014]. ^ SSRN-A Revealed Preference Ranking of U.S. Colleges and Universities by Christopher Avery, Mark Glickman, Caroline Hoxby, Andrew Metrick. Papers.ssrn.com. [February 22, 2010]. ^ America's Brainiac Colleges. The Daily Beast. [January 28, 2012]. ^ RISD Ranks #1 for Fine Arts Grad Programs. 15 March 2011 [9 March 2015]. （原始内容存档于2015年7月27日）.